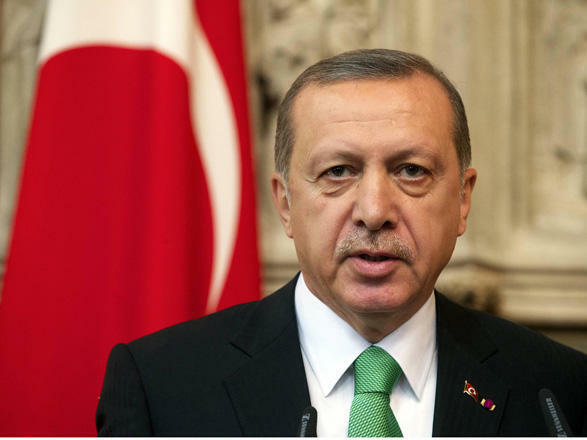 The Nagorno-Karabakh conflict is also a problem of Turkey, Turkish President Recep Tayyip Erdogan said at a parade dedicated to the centenary of Baku's liberation Sept. 15. Therefore, the opening of the Turkish-Armenian border is out of the question, Erdogan added. "Turkey supports and will continue to support Azerbaijan in the settlement of the Nagorno-Karabakh conflict," the Turkish president said. Erdogan said that presently, Azerbaijan is the most important ally of Turkey not only in political and economic, but also in all other spheres. Erdogan stressed that presently relations between the two states continue in all spheres and the roles of the national leader of Azerbaijan Heydar Aliyev and the President of Azerbaijan Ilham Aliyev here is irreplaceable. "We will continue to expand our ties and implement various projects. The joy of Azerbaijan is our joy, the problem of Azerbaijan is our problem," the Turkish president added. "Turkey and Azerbaijan are two sons of the same mother and are brother states. Azerbaijan and Turkey have a common past, religion and language. Our participation in the parade today is a symbol of our brotherhood and the fact that 100 years ago the Turkish soldiers fell here fighting," Erdogan added.